I recall the time when I read about the tragic, unexpected passing away of Mumbai based Dr.Pramod Niphadkar, one of the foremost experts for treating Asthma and Bronchitis. This came as a rude shock as it would not be an exaggeration to say I was indebted to him for giving me a new lease of life. A chronic, acute asthmatic, hospitalised several times, rehabilitated to good health under his care: as were so many others. I felt more than a tinge of regret, though. The very humble Doctor, who always attributed his healing powers to God almighty, had requested a few things of me. Knowing that the illness and the dread of it had to be treated in the patient's minds too, he used to publish a magazine. He asked me to subscribe to it and possibly contribute to it by sharing my experience. Hailing my remarkable recovery as a case study for other patients he suggested one thing more. He regularly conducted seminars and conferences to address his patients (because paucity of time at his over crowded clinic did not allow enough time to resolve all their queries and fears). All he wanted me to do is be a guest speaker at one such seminar where, because then the audience would hear it from the 'horse's mouth'. His reasoning was simple: the patients would find me talking about my recovery more credible and would strongly relate to it. Sadly, I failed him on both counts. Being an extremely shy person in these matters, I did not have the courage to appear before a crowd, leave alone speak there. I baulked at even writing about my illness. Opportunities like these to pay back someone you owe should be grabbed with both hands. If there are some hindrances, God will show the way. The first thought that came to my mind when I heard about this great Doctor's passing away was this. Why? Why didn't I say YES at that time!! Inspired by this incident, have decided to be of help in such matters whenever I can. Well, God has tested me a bit more than many others. On the other hand he has gifted with me with a rare combination of qualities of creativity, communication skills, motivational abilities and a vision to think beyond myself. Have decided to put it all to good use for a cause that begs attention: mental illnesses in India, to be specific, Bipolar Disorder. Have written in the past about my tryst with bipolar already. Suffice to say, am driven by an urge to lighten the suffering of those who have yet to come out of the darkness. 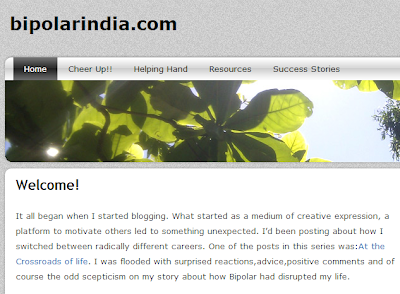 Thus was born, www.bipolarindia.com. There are many people who have inspired me in this cause. It is dear friend, Mentor, Puneet Bhatnagar who literally pushed me into the deep end of the pool! The launch coincides with the tenth anniversary of my first being diagnosed and hospitalised for Bipolar. It has been a long journey but have never experienced such fulfilment before!